Esta cabana encantadora localizada na bela Suches, Georgia, o 'Vale acima das nuvens', dorme 8 (uma rainha, dois cheios, uma cama de beliche (colchões de espuma de memória)) e está literalmente a poucos passos da Trilha dos Apalaches. Aproveite o ar livre ao máximo! Sair da varanda da frente para a floresta nacional e AT, canoa e nadar em parques estaduais nas proximidades (Lake Winfield Scott uma milha, Vogel State Park seis milhas), peixe / caça, fazer compras e comer na vizinha Dahlonega histórico. Os ciclistas também podem percorrer seções montanhosas do Tour de Georgia. Numerosas vinícolas próximas para visitar junto com uma série de cachoeiras atraentes. Menos de duas horas ao norte de Atlanta e localizado no coração da Floresta Nacional de Chattahoochee, esta localização é perfeita para uma aventura ao ar livre ou um retiro relaxante. Por favor, assista ao nosso vídeo! We have stayed at the THE TRAIL CABIN for a week each year for about 5 years. It is one of the nicest VRBO’s that we have rented! The cabin is spotless and well stocked. It’s close to the Appalachian Trail for awesome hikes. There are just not enough adjectives to describe this cabin. You’ll need to see it for yourself! Management company went above and beyond to and make the stay great. Cabin was very clean and as described in the listing. Love it every time we get to be there. 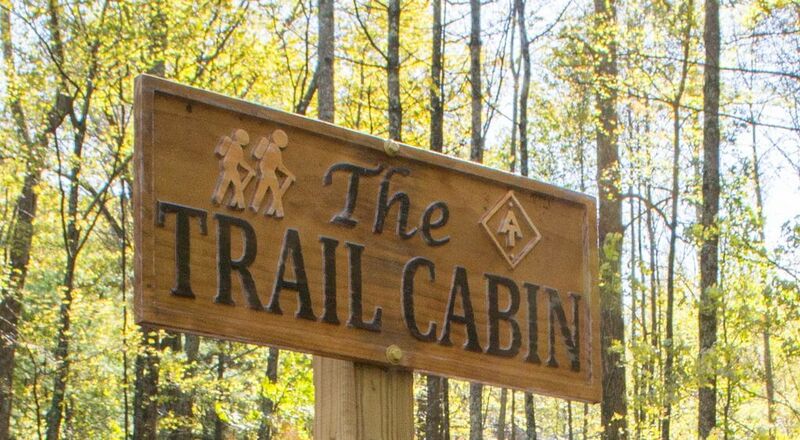 My wife and I were looking for a nice cabin as a good launch point for some weekend day hiking on the AT. The Trail Cabin was the perfect spot. The beds were super comfortable and the home had all the amenities needed for a getaway (including trekking poles which we had forgotten). The kitchen had all the right supplies for making meals. The Appalachian Trail is about 100 yards up a forest right just outside the driveway of the cabin. The owner, Tombo, was super friendly and quickly answered any question we had. We will be staying here again! Super clean and perfect location to walk on the Appalacian Trail. Our family enjoyed our weekend at The Trail Cabin. A nice secluded mountain feel centrally located to many fun activities and places to visit. We can’t wait to come back! Thanks for the wonderful review Lenda. We look forward to the next time you can return. Relaxing, well stocked and just what we needed. Love staying here. Had a group of friends get together and enjoyed every moment. Large parties of 6 or more require a $15 a night additional fee for stocking of additional expendables such as tissue, paper towels, garbage bags, etc.